Worthing Football Club served up a dominant display as they got back to winning ways in the Bostik League Premier Division this afternoon. Goals from attacking duo Kieron Pamment and Reece Meekums, along with wing-back Harvey Sparks' strike saw Worthing ease to a 3-0 home triumph over second from bottom Tooting & Mitcham at Woodside Road. 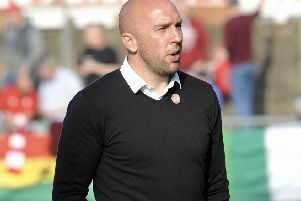 Adam Hinshelwood's side - who were beaten at leaders Dulwich Hamlet last Sunday - bounced back immediately bagging all three points, moving Worthing up three places to 15th. The clean sheet was also a first the home side had managed since New Year's Day. Worthing made two changes from the team that were beaten at leaders Dulwich Hamlet last time out. Anesu Sisimayi and Jared Rance made way for Kieron Pamment and Harvey Sparks. Striker Reis Stanislaus lead the line for Tooting on his return to Woodside Road. Forward Pamment was restored to the starting line-up after missing out through illness at Dulwich and fired the home side ahead inside three minutes. Defender Sam Rents' precise pass played Pamment in, he then thundered home his 17th league goal of the season. Worthing saw a lot of possession after their early opener but were not looking a threat. Tooting pieced together a flowing move, nearly levelling on the half-hour. Wing-back Harvey Sparks did well to nip in before Isaiah Jones as he looked to get on the end of Peter Wedgeworth's dangerous cross. Alfie Young survived a scare a minute before the break. Worthing were continuing to play out from the back, with centre-half Young caught in possession by Stanislaus but he fired an effort well over. Defender Joel Colbran wasted a great chance to double the home side's lead a minute after the restart. Colbran was left unmarked from a Rents corner but headed wide. Worthing were dominant and got a second on 56 minutes. Meekums - playing further forward after the break - got in behind, picked out Sparks who coolly fired past Matte Pierson. Meekums then got a goal of his own 17 minutes from time to wrap up the points for Worthing. Starkey's superb pick out found Meekums, he kept his composure, slotting past Pierson. Substitute Elijah Simpson poked over from a corner late on but Worthing held out, keeping a clean sheet for just the second time in 2018. WORTHING: Covolan; Colbran, Young, Rents; Meekums, Clarke, Barker, Sparks; Pamment, Starkey; Newton. Subs: Sisimayi (Colbran, 78), Rance (Newton, 78), Luff, Racine (Clarke, 63).